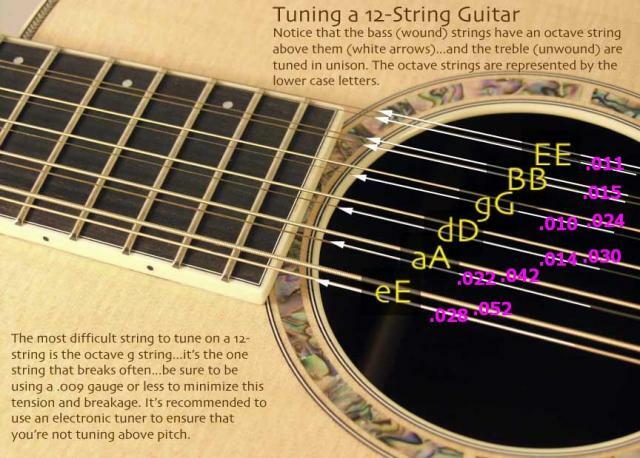 Gear Vault » Gear » Guitars » Tech Ed » How to Tune a 12-string Guitar and what Gauge Strings? I recently picked up a 12-string guitar from craigslist.org, and I have no idea how to string it or tune it, nor do I know what string gauges are typically used on this style of guitar. Can you help? Also, is it possible to use a 6-string tuner to tune a 12-string guitar? You’re not alone in your confusion, Chris. 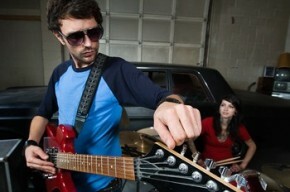 Many six-string guitar players aren’t familiar with the proper way to tune a 12-string guitar. In reality, a 12-string is tuned very much like a six-string, except that each of its strings is paired with another string of the same pitch or a pitch one octave higher: On 12-string guitars, the low E, A, D and G string pairs are tuned one octave apart, while the B and high E string pairs are tuned to the same pitch. The accompanying chart shows the string parings and indicates typical string gauges. As for your question about tuners, the answer is “maybe.” Some cheap (or “inexpensive”) tuners can only recognize standard six-string pitches and will ignore the higher pitch or the octave strings (i.e., the high A, high D and high G strings). If your tuner doesn’t recognize these tones, you should upgrade to a better six-string tuner or, better yet, a chromatic tuner, which will recognize every pitch. 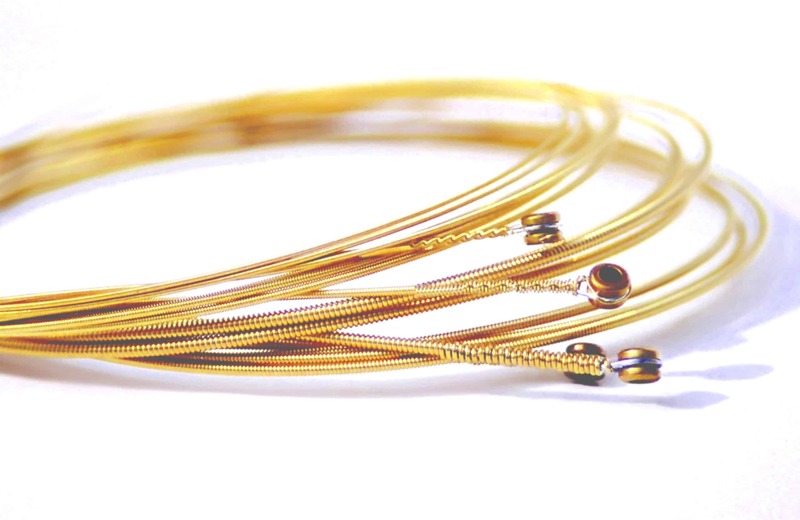 Hi Karen, the lighter (thinner) strings start on the bottom up and the heaviest (fatter) string is on the top. So if .11 is the smallest gauge, the biggest gauge .52 will be on the top. The diagram is quite helpful; and I was going to try to string my 12 guitar for the first time and I just discovered the DR box I purchased at an “out of business sale” with only 10 strings inside!, is the “gauge sequence accurate” in the diagram shown?, this box has the following gauge numbers:.048, .039,.030, .028, .024, .018, .014, .012, .010 & .009. The reason of my frustration is that I may be missing a .020 und a .022 but I don’t see in the diagram a .009 or a .012?, could anyone send me a personal sequence, pertaining gauges; and number them 1,2,3,4,5,6,7,8,9,10,11,12? from top to bottom please! I would appreciate your help! Been playing accoustic and electric 6 stringers, first experience with a 12 and my .052 (low E) broke while tunning and I decided to get my new set out with the results described! (catastrophic). The setup in the diagram shows .11 gauge. Sounds like you bought .10 gauge, which are a tad bit lighter / thinner string gauge. It appears you are missing the .010 and .014. Good diagram. 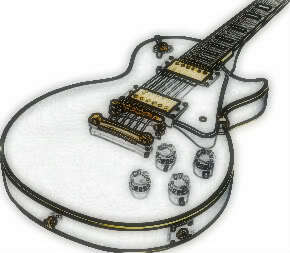 Mine is strung with the smaller strings on top except my low E string. I like the low E to be the top string. I prefer the sound of the low E first when I strike chords. So far I’ve only found one (1) thread on the internet that cuts to the chase on 12 string guitar tuning. Many other threads are teaching the higher octave strings on the low E, A, D, G strings by directing you to get the tone by ear by fretting strings up near the headstock. That’s crazy! You might as well be doing the low E with a pitch-pipe and doing the old fashioned Low E 5th fret = pitch on Open A and all that jazz. Forget that! Get a cheap electronic tuner, and put capo on 2nd fret (a must! ), and tune up the standard strings to E, A, D, G, B, E. Then tune your high “little” E and B strings to standard E and B pitch. Now for the small G string, I want you to tune it to G on the 14th fret– this means you’ll be fretting it at the 14th fret when you pluck it and tighten until the tuner says you’ve achieved a G pitch, and that will be your 1 octave higher G. Simple. Do the previous mentioned to your D, A, E “big E” strings and you are set. You can try this without a capo and tuning the higher octave to the 12th fret, but I would not recommend it. Even the crazy expensive 12 string manufacturers such as Taylor advise against it. If you see a 12 string star performer on tv or in concert playing standard concert EADGBE tuning without a capo, keep in mind that they are given free guitars by the manufacturer and have free spares. And trust me the roadie guitar tech releases the tension in a hurry when the performer hands one off and goes back to 6 string. I wouldn’t mess with your mind on this. And all I can say is that my cheap no-name Made In China electronic tuner ( With a Patent date of 1995 on it ) can discern that corresponding higher octave note. Experiment on the little E strings– get them tuned to E on the second fret, then fret them at #14 fret and that E note should appear. (Note: don’t worry about how at the 14th fret it’s not dead on the money and flat or sharp, that will always be the case on an acoustic guitar unless it’s crazy expensive and has a custom carved saddle “bone” to exacting intonation. Anyway, for below $35 I’m sure you can get a satisfactory electronic tuner. But I’d advise you to go to a music store and test their model to make sure it can reckoning 1 octave higher notes on the EADG strings. You will be scared while tuning those higher octave strings. That’s normal. When you get the higher octave strings tuned to standard and keep tightening they WILL disappear on the right side sharp “#” side of the scale, and they wont appear again till the 14th fret. Be sure to keep the tuner on while tightening and no radio or tv on. When the higher octave EADG notes show up on the flat “b” side of the scale you’ve got to be ready, because in 1/4 turn they’ll be gone off the “#” right side of the tuner, and if you missed it you’ll be tuning into no man’s land and perhaps pull off your bridge! Thanks for the great post, JackAssin.